Bonalu and Bathukamma are the official festivals of Telangana. 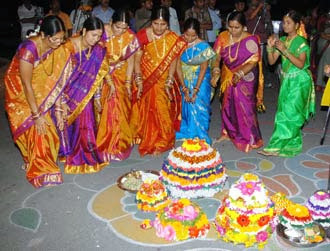 Bathukamma is a festival unique to the state. The festival is celebrated by the women of Telangana during Dussehra. During Bathukamma festival the women folk arrange colorful seasonal flowers in a cone shaped structure on a wide plate, place a small idol of Goddess Gowri (Parvati) made of turmeric paste on top of the floral cone and worship Her. 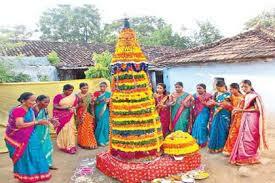 Such a unique way of flower arrangement during the festival, is known as Bathukamma. 'Bathuku' is a Telugu word which means 'life' and the Telugu word 'Amma' refers to Mother. The word 'Bathukamma' is derived from 'Bathukunu iche amma' i.e the mother who gives life. In this context, it is Goddess Gowri Devi who is the life-giver to the married women, Hence, the women make 'bathukamma' and worship Her for 9 continuous days for a happy and prosperous married life. The festival begins on Mahalaya Amavasya day and culminates on Durgaashtami day during Dussehra Navaratri. It usually falls in the months of Sept / Oct.
gaddi puvvu (daffodil) etc are also used for the floral arrangement. As per custom, married women visit their parents place to celebrate the festival. From day 1 to day 7, they make small Bathukammas'. In the evenings they sing and dance in a circular path round the Bathukamma. And immerse these in small water bodies like ponds near their house. The last two days i.e day 8 and / or 9 are very important. It is known as 'Saddula Bathukamma' and is celebrated in a grand way. All the family members take part in this festival to make big Bathukamma with colorful flowers. 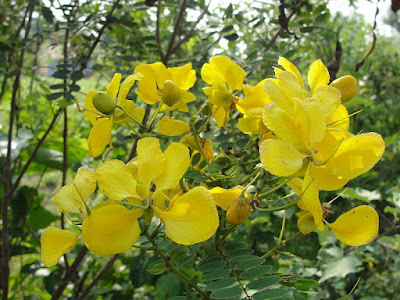 These flowers are arrange in circulars rows in a brass plate called 'taambalam'. 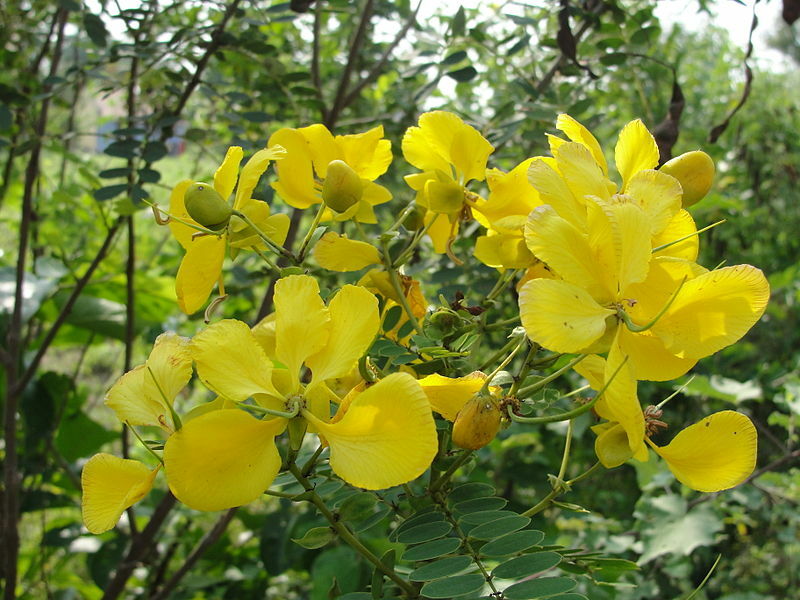 The flowers are arranged in alternate colors to form a cone shaped 'gopuram' like structure. This 'Bathukamma' is placed in the backyard and women dressed in traditional attire dance moving around the 'Bathukamma' and sing folk songs like 'Bathukamma Bathukamma vuyyalo, bangaaru Bathukamma vuyyalo. After sunset the women carry 'Bathukammas' on their head and go in a procession towards the community tank / bigger water body. This is a colorful and lively procession. The 'Bathukammas' are then slowly immersed in the tank / pond. They get back to their homes with empty 'taambalams'. Then they share 'maleeda laddu' a sweet made of raw sugar and corn bread, among their family members and neighbors. The unique folk festival of flowers is the cultural identity of Telangana.